MK Bezalel Smotrich calls for urgent Knesset meeting, aims to pass law removing Supreme Court's ability to approve or disqualify candidates. 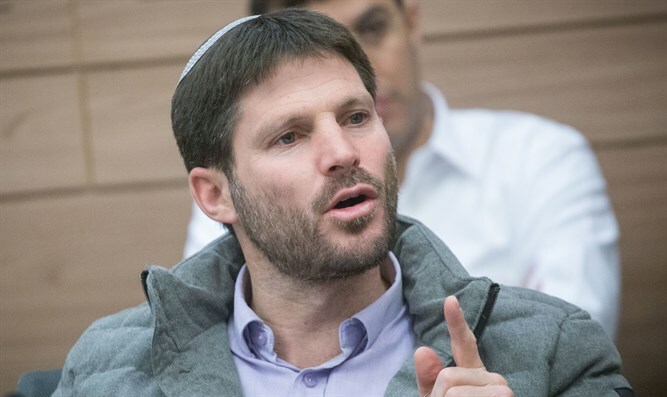 National Union Chairman MK Bezalel Smotrich on Monday called a Knesset meeting to cancel Section 7a, on which the Supreme Court based its decision to disqualify Otzma Yehudit candidate Dr. Michael Ben-Ari, but which the Court ignored with regards to the terror-supporting Arab parties. "We heard a lot of condemnations of the Supreme Court's decision yesterday, but words are not enough - it's time to act," Smotrich said. "For the first time in the State of Israel's history, a 'council of wise men' is deciding who Israel's citizens are allowed to vote for, instead of the voters deciding." "The Supreme Court justices disqualified a candidate due to his views regarding Israel's enemies, but approved parties which openly identify with Israel's enemies. This distortion of justice must be corrected today." Smotrich also penned a letter to Israeli Prime Minister Binyamin Netanyahu, coalition party heads, former Defense Minister Avigdor Liberman (Yisrael Beytenu), Knesset Speaker Yuli Edelstein, and coalition whip David Amsalem. In the letter, he emphasized that the Supreme Court's decision "places Israel together with countries such as Iran, which have a council of wise men which is authorized to decide, instead of the voters, who may and may not be chosen for parliament." "In recent days, all of you expressed opposition to this outrageous decision, which is even more outrageous in light of the fact that it allows terror supporters who oppose Israel's right to exist as a Jewish and democratic state to run for Knesset. "Words are not enough. The Knesset must bring back democracy, for its own sake and that of the nation. I call on you to gather for an urgent meeting, held despite the break. [This meeting] will continue for as long as necessary and quickly pass the attached bill, which cancels the Supreme Court's right to serve as a high council and will allow Dr. Ben-Ari to run in the upcoming elections. "Despite the importance of the Supreme Court's decision and the fact that it affects the constitutional right to vote and be elected, we have no right to appeal it. Therefore, we must see the Knesset as a body which can be appealed to, and which has the ability to cancel the court's distorted decision."